Dunlop has announced the addition of the Ringworm to its Way Huge range of boutique-style pedals, giving weight to the old adage that "if you like it then you should've put a ring modulator on it". Originally announced at Winter NAMM earlier this year, the Ringworm features five different LFO (low frequency oscillator) waves, as well as depth, rate, blend and frequency controls. As with all Way Huge pedals, the Ringworm has been designed by Jeorge Tripps - the man who originally started the company back in 1992, before the deal to produce and distribute them in conjunction with Dunlop was struck in 2008. 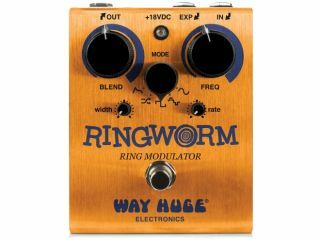 The current MSRP for the Way Huge Ringworm ring modulator is £179.99, though we reckon you'll probably find it in stores for about £20 less than that figure.